Researchers from RIT and the University of Delaware have collaborated with the U.S. Department of Transportation’s Maritime Administration to create a web-based version of the Geospatial Intermodal Freight Transportation System. The new system analyzes the economic, time-of-delivery and environmental performance of various freight-transportation routes using road, rail and water. 10:15 a.m., June 25, 2014--A new web-based version of the Geospatial Intermodal Freight Transportation Model (GIFT) has been released as part of a five-year initiative among researchers at the Rochester Institute of Technology, the University of Delaware and the U.S. Department of Transportation’s Maritime Administration. The new technology, which utilizes mapping software similar to Google Maps, analyzes the economics, time-of-delivery and environmental performance of various freight-transportation routes using rail, road and water. With this web-based version, companies and local, state and federal government agencies can make decisions that are not only financially feasible, but also environmentally sustainable. For example, a company can evaluate the economic costs and greenhouse gas emissions associated with moving goods along various freight corridors using different transportation technologies and choose options that meet corporate goals, customer desires and regulatory mandates. “Visualizing 21st century freight innovation will help engage all partners in the supply chain to see where energy savings, environmental targets and economic choices serve a sustainable triple bottom line,” according to James Corbett, professor of marine policy in UD’s College of Earth, Ocean, and Environment. 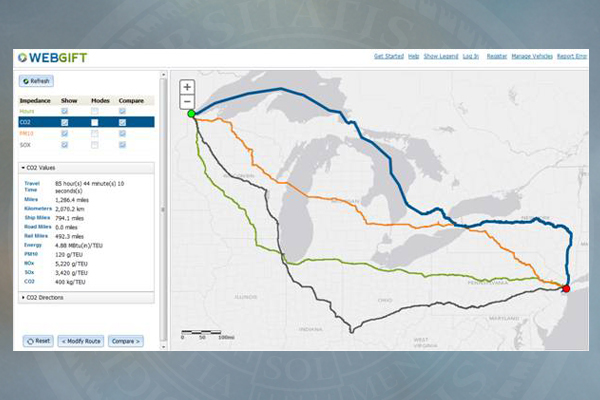 The system, called WebGIFT, includes updated transportation connections between the U.S. and Canada; road-speed data for more accurate travel calculations between origin and destination points; and tested case studies that reveal which shipping routes may produce lower emissions and lower costs. A key feature of WebGIFT is that emissions rates, economics cost factors and other variables can be adjusted to reflect a variety of operating scenarios. Funding was initially secured in 2010 under the Sustainable Intermodal Freight Transportation Research program, a collaborative effort aimed at improving freight decisions through innovative, data-driven, transformative research in four key areas: energy, environmental and economics analysis; congestion and modal analysis; safety, security and infrastructure resilience; and data acquisition, storage and access. The U.S. Department of Transportation (DOT) was an active partner in the development and rollout of WebGIFT, providing modal data necessary for the calculation of travel times, and awarding the project numerous grants through the Maritime Administration, a DOT agency. James Winebrake, dean of RIT’s College of Liberal Arts and one of the primary researchers on the GIFT project, explained the value of using the new web-based system. “For instance, a company planning to move goods from Hong Kong to New York City can use GIFT to evaluate time-of-delivery, environmental impacts and economic costs associated with this freight movement,” he said. “They can also use the model to explore how environmental impacts may be reduced using alternative routes or modes of transportation, and what the economic and/or time-of-delivery tradeoffs associated with these alternatives may be. The collaboration with the DOT’s Maritime Administration builds on research conducted by Corbett, Winebrake, Karl Korfmacher of RIT and Scott Hawker of RIT. UD’s College of Earth, Ocean, and Environment (CEOE) strives to reach a deeper understanding of the planet and improve stewardship of environmental resources. CEOE faculty and students examine complex information from multiple disciplines with the knowledge that science and society are firmly linked and solutions to environmental challenges can be synonymous with positive economic impact. The college comprises the School of Marine Science and Policy, Department of Geography and Department of Geological Sciences. CEOE brings the latest advances in technology to bear on both teaching and conducting ocean, earth and atmospheric research. Current focus areas are ecosystem health and society, environmental observing and forecasting, and renewable energy and sustainability.